The Metropolitan Washington Road & Transportation Builders Association (MWRTBA) held its bi-monthly member breakfast meeting on March 26 at the ARTBA building in Washington, D.C. The meetings are networking and learning opportunities for transportation construction professionals in the District of Columbia and the Metropolitan Washington area. A briefing on the status of the District of Columbia Power Line Undergrounding, or DC Plug Project, was the focus of the event. 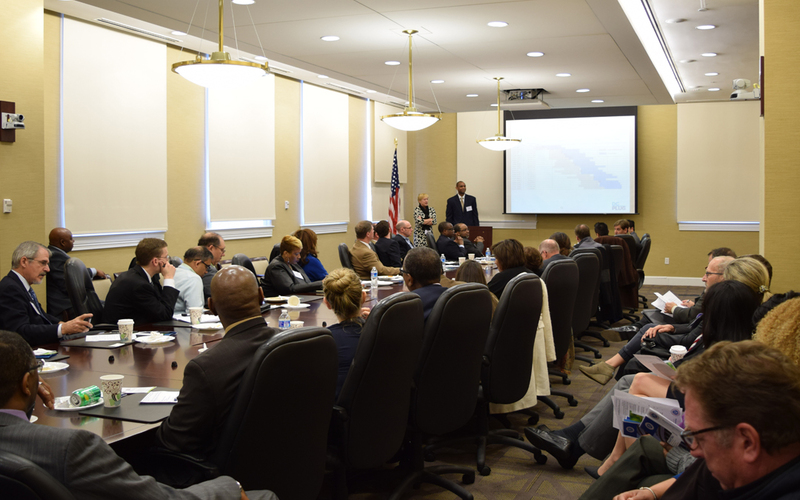 Keith Foxx, program manager for the District Department of Transportation (DDOT) and Caryn Bacon, director of underground projects for PEPCO, detailed the project’s benefits to D.C. electricity customers as well as the status of the $1 billion project. The DC Plug Project is expected to improve reliability in areas historically most affected by overhead-related power outages, especially during “significant” weather events. About half of the District’s power lines are already underground. There will still be secondary and service lines running overhead on existing poles, but those lines are typically smaller factors in outages. Restoration time on lower-voltage lines is normally much shorter than on high-voltage primary lines, which can require several hours for repair, according to PEPCO. More information on the project can be found on PEPCO’s website. A special recognition prior to the project briefing was bestowed on MWRTBA vice president Sam Patel, of Fort Myer Construction Company. Sam was honored at an event in Arlington on March 24 as VIP for 2015’s National Work Zone Awareness Week, which kicked off on March 23. MWRTBA’s membership includes contractors, subcontractors, materials suppliers, engineering firms, law firms, accounting firms, bonding and insurance firms, the construction equipment industry, and the traffic safety products industry. Contact MWRTBA Executive Director Mike Sakata or visit www.mwrtba.org to find out more.